JANEA is honoured to interview Ms Yuki, Founder, Trainer and Top Stylist of My Sassy Lashes. She is a professionally trained and JANEA Certified Eyelash Specialist who provides Japanese Style lashing technique in Singapore. With 7 years of experience in this industry, Yuki’s newly renovated salon only hires professional trained and certified eyelash specialists. My Sassy Lashes is one of the pioneer JANEA Certified Eyelash Extension Salon in Singapore and strictly uses safe and high quality lashes and lash glue imported from Japan. 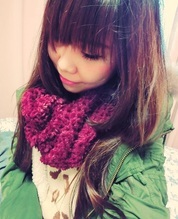 Yuki: “ It depends solely on the salon owners and staff. In some places, the level of salon hygiene is very low, while some salons are very clean and hygienic. Most of the salon hygiene standards are pretty obvious thru visual observations, such as clean bed sheets and blankets, and if the salon sanitise the tools in front of customers, to name a few examples. 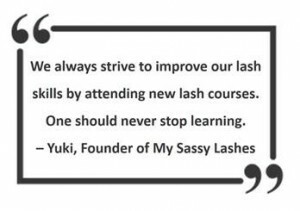 Yuki: “ We always strive to improve our lash skills by attending new lash courses. One should never stop learning. Improving existing skills sets and being well equipped with new lash skills are vital. And of course, getting the professional certifications such as JANEA Eyelash Specialists helps us to stay ahead in this competitive industry today. High quality products that are safe to use on customers, are extremely important too. We can never compromise that. Lastly, providing good service and comfort to customers is our top priority.